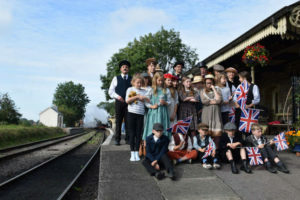 Having not directed for Wedmore for a few years, I said that I would like to direct the autumn production – not knowing that it was going to be suggested that we perform that wonderful classic, The Railway Children. At the time, I did not even know that this had been turned into a play but was only aware of it as a film. We held auditions on 22nd July and having publicised this in both the IOW News and posters around the area, I was thrilled to bits with the number of people who came along to read the script and over 36 people put themselves forward for parts in the play. As a result, we have a real community play with a cast of over 30 people, many of whom have not acted with Wedmore Theatre before. You may be wondering why some names have an A or a B alongside – well, we had so many wonderful youngsters come along to the audition that we didn’t want to disappoint any of them. As a result, we have two teams over the four performances and depending upon which performance you are watching, you will be seeing either Team A or Team B. Directing two teams has certainly presented quite a challenge – both teams have rehearsed on the same evening. Not only did I have to tell the first team what I needed from them but then had tell the second team to do exactly the same thing. Some of the youngsters are in both teams and just occasionally I have been told by one of them that that was not what I had asked them to do first time round! Staging a production is also a challenge when scenes are determined by the lighting, sound and use of different acting areas. We needed a cottage, garden, a station and a railway! I have been so lucky to have had such a wonderful cast and crew to help me put on this production – it certainly could never have been performed without all those mentioned in the programme. I must make special mention of all the young people who are taking part – their enthusiasm has been catching. The speed with which they knew their lines was incredible and it has certainly helped with directing them. Our thanks also go to Sophie and her staff at Wedmore Village Store for selling tickets, and to the East Somerset Railway and to all those who have loaned us props. For many of us of a certain age, we remember with great fondness the film directed by Lionel Jefferies. Whenever I see it (usually at Christmas when it is one of the staple films that are put on at that time) I cry at the end. It is a film with such an iconic ending. Thank you for coming along to our production of the Railway Children and I hope you find our version of The Railway Children as tear-jerking as the film!